CLEVELAND, May 31, 2017 /PRNewswire/ -- Wisr, a company that helps higher education institutions create knowledge sharing communities to track student and alumni engagement, was recently honored with a Venture Innovation Award at the 2017 ASU+GSV Summit, hosted in Salt Lake City. Wisr, a Cleveland-based educational technology company, was recently honored with a Venture Innovation Award at the 2017 ASU+GSV Summit, hosted in Salt Lake City. Earlier this month, the company also received financial backing from Cleveland-based investor JumpStart Inc. in the form of a $250k investment from the firm’s Focus Fund. Competing alongside more than 250 ed-tech companies, the Cleveland-based software-as-a-service (SaaS) company was just one of three organizations that received a Venture Innovation Award during the summit. The award recognizes emerging technology companies who are poised to have a massive impact on improving the education industry. Held annually, the ASU+GSV Summit is a three-day conference presented by Arizona State University and Global Silicon Valley which convenes innovators to explore the latest developments in education and talent technology from K-12 to higher education, the future of work and global education and talent management. "Having launched products for higher education institutions in the past, Co-founder Kate Volzer and I knew it was critical to listen, learn and earn early buy-in from educational institutions." said Wisr Co-founder and President John Knific. "So, we limited our initial launch of Wisr to our five institutional development partners. 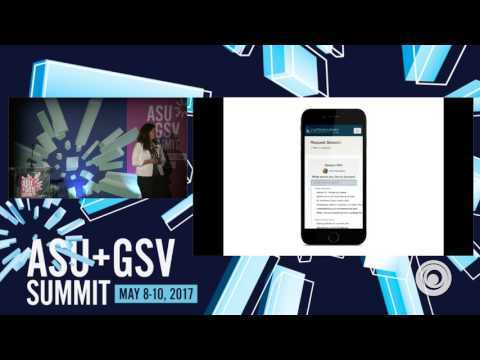 That was very well received by the ASU+GSV audience, who are experts in the industry and were looking for demonstrable outcomes." Earlier this month, Wisr also received financial backing from Cleveland-based investor JumpStart Inc. in the form of a $250,000 investment from the firm's Focus Fund. The deal comes nearly a year after Wisr received an initial $25,000 validation investment from the same fund. JumpStart's Focus Fund is designed to invest in high-potential, tech startup companies led by female or minority entrepreneurs throughout Ohio—as well as those willing to move to the state. The fund invests between $250k-$600k into early stage companies that can leverage capital and IP/technology to achieve transformational growth in sectors such as Software, Medical Technology, Advanced Materials, Power Management, Energy Applications or Business Products. "As a boomerang back to Cleveland, it's wonderful to be welcomed back with such open arms," said Wisr Co-founder and CEO Kate Volzer. "Venture capital is primarily a male-dominated profession, which makes the Focus Fund's presence here even more special. We're thrilled to have the backing of JumpStart and we look forward to continuing to grow our team in the City of Champions and expanding our customer base over the next year." Launched in early 2016 by Volzer, Knific and Co-founder/CTO Kris Ciccarello, Wisr was designed to remove the inefficiencies inherent in creating connections between students, alumni and other members of a university community. The software—already in use at institutions such as the University of Chicago, Case Western Reserve University and Oberlin College—gives students the opportunity to seek advice and career assistance directly from a broad base of alumni. It also frees career services staff to focus on their core job functions and provides alumni relations staff with important engagement data. "Wisr's impact reaches far beyond simply streamlining processes for educational institutions," said Rem Harris, JumpStart's senior partner in charge of investing. "The platform provides students with direct access to high-quality advice and career connections while also giving alumni a low-cost, non-time intensive way to give back to their alma mater. This leads to higher alumni engagement and better student outcomes." WISR is a Cleveland-based educational technology company that provides an engaging space for alumni and students to connect with each other. For more information, visit www.getwisr.com and follow @wisrcommunity on Twitter. ASU+GSV SUMMIT is a conference that brings together the most impactful people from diverse constituencies—entrepreneurs, business leaders, educators, policymakers, philanthropists, and university and district leaders—to create partnerships, explore solutions, and shape the future of learning. For more information, visit www.asugsvsummit.com and follow @asugsvsummit on Twitter.